May 25, 2013 by Verle L. Bell, M.D. When I started in medicine many years ago, we were only able to relieve the depression and anxiety or chronic pain in about 40% of sufferers. However we did much better in comforting and supporting the ones who couldn’t find relief in medication. Now we have much better % of people who find relief but tend to never address the problem of: THOSE FOR WHOM NOTHING WORKS. Because there seems to always be some other, magical, medication to try, the sufferer does not even want counsel on what to do if nothing works. They often waste years of their lives waiting to start their lives back up until after the pain is gone. To quote William Goldman, “Life is pain, anyone telling you different is trying to sell you something.” John 16:33 In the world ye shall have tribulation, but be of good cheer, I have overcome the world. First Peter 4:12 Beloved, think it not strange concerning the fiery trial wich is to try you as though some strange thing happened unto you. 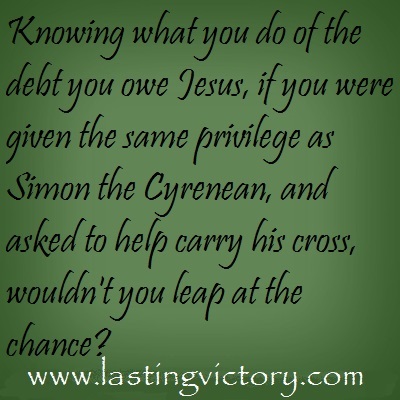 Knowing what I do of the debt I owe Jesus, if I were given the same privilege as Simon the Cyrenean, and asked to help carry his cross, wouldn’t I leap at the chance? He was forced to help Jesus carry the cross but I am given the chance to do so by choice, to take up my cross daily and follow him. I am not for a moment saying that we Christians should seek out pain and be masochistic. We should seek relief and help but should also respond daily to whatever the pain that today brings, despite our best efforts, by praying “THANKS, HELP, SHOW ME HOW YOU WANT ME TO RESPOND” Helping him carry the cross means joining in, by grace, to his burden for those who suffer and to bear my suffering with his attitude. He will give me grace for today only. I must not attempt to summon grace to deal tomorrow, with the possible journey of years of suffering. God gives me no grace for tomorrow until I arrive at tomorrow. I must not worry at all about tomorrow I have enough evil to deal with today. When my mind zooms in on the things that I can’t do because of today’s pain, I ask God for grace to ask the question, “Yes but what can I do? What do I have? Who is in my life?” I believe that part of his answer will always be to pray for others and to pray praises to him, not just in spite of the suffering but even for the suffering. Then I need to be real in sharing both my struggles and the fact that he is still worthy of praise even if he does not fix the pain! I had a sweet godly friend who was dying of recurrent cancer. The doctor’s held out no hope and turned her over to home care. If she would have told the unsaved friends at work that ” God can cure me, but if he doesn’t he is still worthy of praise, and yes my husband and son have abandoned me but God has provided family.” (My wife Lois helped nurse her at the end of her life) Then the unsaved friends would have had to consider the greatness of such a God. However, when she kept saying, “God will cure me” right up to her death; They simply said “Those weak Christians need crutches, how sad that they can’t deal with reality”. This entry was posted in Uncategorized and tagged ATTITUDES of peace and power, chronic pain. Bookmark the permalink.